I still remember watching Pitch Perfect for the first time. A Glee episode with a better cast was not my idea of fun, but it had so much heart and humour you couldn't help but fall in love with the damn thing. Oh well, what else you gonna do on a sunny Sunday afternoon? 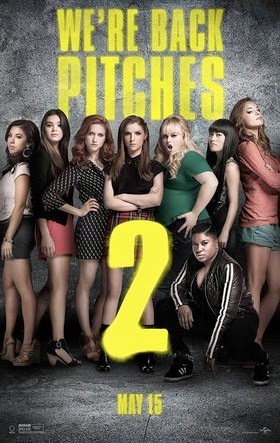 Picking up three years after they left us, PP2 has the girls still together and still hugely successful on the acapella scene. Until Fat Amy has a slight accident in front of the President. Still, from such unlikely scenarios comedy sequels are born, and so the girls set about regaining their reputation while having personal growth moments en route to the World Championships in Denmark. If you saw and loved PP1, PP2 has everything you want. It's not quite as good as the original (but hey, what is? ), but that really doesn't matter. Anna Kendrick and Rebel Wilson again lead the way, re-energising their characters with huge amounts of warmth and humour, while (as before) the rest of the cast help add to the chaos and the fun. Holding the whole thing together once more are John Michael Higgins and writer/director Elizabeth Banks as the bitchy commentators who are now running their own podcast and seemingly somehow not getting sued in the process. Granted, this is not as flawless as the first film - a lot of scenes end up feeling like sketches that have been loosely linked and the German group feel more than a smidge cliched - but it makes you laugh. There are cheap gags, clever gags, slapstick gags, moments that make you squirm... It's got the lot. And more cheesy pop and rock songs than you can shake an oar at. Plus a list of cameo stars that no self-respecting dog could sniff at. And that's why you can forgive the flaws - up to, and including, the fact no one actually sings acapella as there's always a sodding drum machine kicking about somewhere. And everyone's been auto-tuned beyond repair. One of the clever tricks PP2 pulls is to sneak in some really dark bits of humour to puncture the more sweet moments, meaning you're never quite sure where it's heading next - while at the same time knowing exactly where it's heading. It's not dark, or edgy, but that doesn't matter - it's a comedy, it's job is to make you laugh, and it manages that in fine style. And yes the ending is about as saccharine as you'd expect, but by then you won't care about the fact your eyes seem to be leaking. Just make sure you stay for the post-credit Voice sequence.